I tend to make a selection of pâtés all at once - it's just easier that way. You can store them in Kilner Jars until you need them, and they make perfect gifts for friends. This pâté is really tasty, with all the flavours of a good rural kitchen. Top tip: If you can't find mixed wild mushrooms, then try dried shitake mushrooms instead. 1. Place all but a handful of the wild mushrooms in a food processor and, using the pulse setting, mix until they are the size of large bread crumbs. 2. In a large non-stick frying pan melt 50g of butter with the olive oil. Once melted add the mushrooms to the pan with the thyme sprigs and a clove of garlic, peeled and crushed. Cook over a low heat for roughly ten minutes keeping the mushrooms moving. Add the white wine and cook for a further 10 minutes. The mushrooms should have soaked up all the butter and wine by this point. 3. Return the mushrooms to the food processor, removing the thyme branches. Locate the handful of mushrooms that were set aside and roughly slice into smaller pieces no bigger than 2cm. Soak these mushrooms in a tbsp of boiled water and leave to one side whilst preparing the rest of the pâté mix. 4. Peel the shallots and remaining garlic. Dice the shallots and crush the garlic. Melt 50g of butter in a large non-stick frying pan, and add the shallots and garlic, then cook on a medium heat for 1 minute. 5. Clean the chicken livers and add to the pan. Cook through until the livers are just browned but the middle is still pink. Add the brandy and heat for another minute. 6. Transfer the contents of the pan, plus juices, to the food processor. Add the nutmeg and season well with salt and pepper. Mix until almost smooth then pour in the cream and mix for a further 2 minutes. With a spoon stir in the larger pieces of mushrooms that had been left to soak. 7. Transfer the pâté to a Kilner jar (or other appropriate receptacle) and cover with clarified butter, made from the remaining butter. Press a sprig of thyme into the butter for decoration. 8. Leave to chill in the fridge for at least 4 hours before serving. Serve with a crusty white baguette or warm toast. 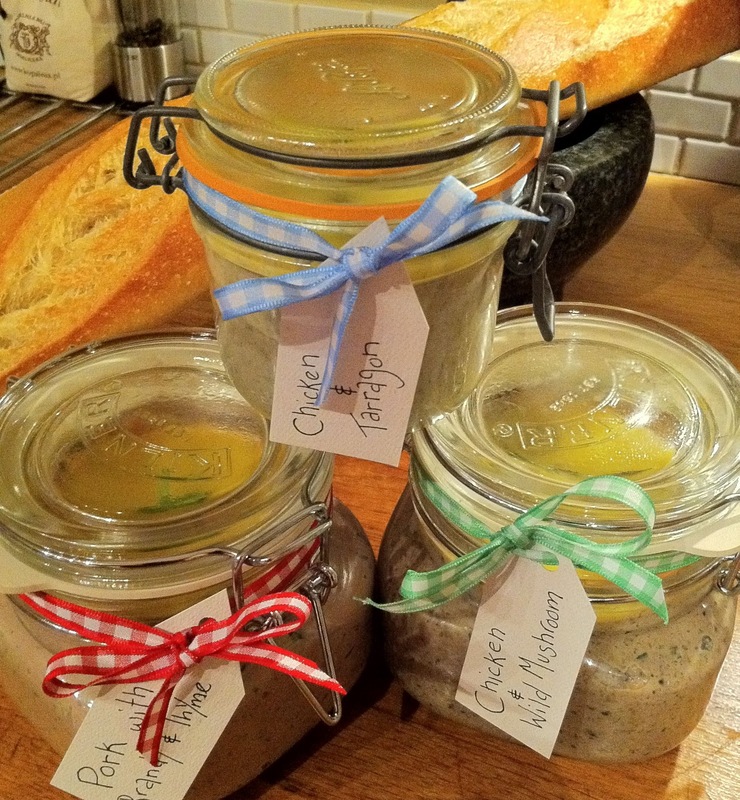 Why not also try my Chicken Liver & Tarragon Pâté, or my Pork with Brandy & Thyme Pâté !